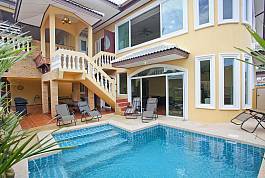 Please, take your time and enjoy browsing through our vast array of high standard Villas that are available to rent in Pattaya, on a short and long term basis. We have put in an incredible amount of hard work to ensure that we have compiled one of the most comprehensive and impressive lists in the region. Though we deliver a large variety, we are always irrefutably dedicated to providing only the finest quality. This is a standard that we have endeavoured to maintain since the very beginning and with well over ten years of experience in the industry; it is evident that our overall ethos and work ethic is effective. When people are looking to book a holiday home, whether it is a luxury, sea view villa, or a quaint condo in a quiet area – we appreciate that quality is always of the most paramount importance. Naturally, like anything else; the more money you tend to spend on a product or a service, the higher the standard you would expect to receive – though unfortunately this isn’t always the case with some companies. Situated in East Pattaya, just 3 km to Sukhumvit Road in a popular expat area, this seven-bedroom villa is close to a number of bars and restaurants, and 6.5 km from the nearest beach. Very serene, with a private swimming pool and a game area including a pool table, ping-pong table, and dart board, it is a prime accommodation option for groups. Holidays are all about FUN, and you will certainly find fun when you book the 7 en-suite bedroom Villa Fiesta. Recently refurbished, this holiday home is perfectly located for quick and easy access to the delights of central Pattaya, the quiet Jomtien Beach, and is within walking distance of bars, restaurants, mini supermarkets and a local market. With the relaxed atmosphere and all-round comfort offered inside Villa Fiesta, however, you will be in no rush to leave it too quickly. 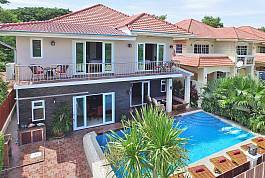 The 7-bedroom Baan Calypso is our signature property in Jomtien, Pattaya. The terrace boasts amazing design features like built-in BBQ area, plentiful seating, custom lighting, and a large pool with in-pool seating and Jacuzzi. The interior is a stunning combination of Lanna-Thai craftsmanship and modern design, with plenty of space for everyone to enjoy a delightful, relaxing holiday. 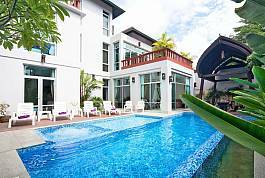 Located just 500 meter from Na Jomtien beach, this chic 7 bedroom villa is everything and more when it comes to Pattaya rental homes. With a private pool and enough sleeping space for 14 people, Jomtien Waree 6 is a unique villa, offers privacy, comfort and plenty of close by attractions. Set in a private location at Huay Yai, the 7-bedroom Huay Yai Manor is a real private palace. With large gardens, a swimming pool, pool table, and a minibus with driver, you can create the tropical getaway of your dreams. Sleeping 14 adults, this extraordinary villa ensures that you will holiday in total privacy and luxury. 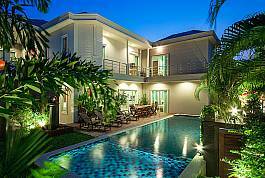 Situated in a central location between Pattaya and Jomtien, this modern and luxurious 7 bedroom villa sleeps up to 14 people. It has a private swimming pool with integrated kids' pool, multiple spaces for relaxation, surround system, indoor and outdoor dining, and many more holiday comfort amenities. We have worked hard to build up and maintain a reputation as being a reliable and well-trusted agency. This was through dedication, hard work and always striving to put the customer first. We want all who work with us, to feel as though they have been thoroughly taken care of, having all factors taken into consideration. We want you to have the best holiday or long stay that you possibly can, because not only do we understand the importance of a well-deserved break from work, but also because a happy customer always spreads the good word. Have a gander through and if you can’t find what you are looking for then please do not hesitate to contact us. We will do our very best to help you narrow down the search and secure the perfect booking.